Because there are now so many crop circle web-sites, we have listed only the primary sites in each country; each of these will link you to dozens of other sites. At the bottom of this page we have also listed sites where you can order videos/photographs/books & magazines/calendars/T-shirts. David Pratt's "Crop Circles & Their Message"
This feature-length documentary, produced by Academy Award nominated Director William Gazecki in 2003, features multiple interviews with leading crop circle researchers and stunning aerial footage of British crop formations. 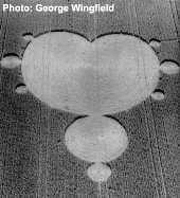 Physical changes found in the cropcircle plants and soils are discussed, as well as various theories regarding the origin and nature of the phenomenon. From Norwegian TV producer Terje Toftenes, this video won 2 "EBE" awards at the February, '06 Laughlin, NV film festival. 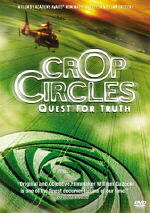 Winner of the UFO Congress Film Festival's "Best Feature Documentary," filmmaker Suzanne Taylor presents her interactions over 6 summers in England with an international community of crop circle enthusiasts. The film argues that the materialistic worldview of many Westernized countries hampers serious investigation and presents indications that a genuine mystery exists.